UNUSBL BYD 8 DEG LEFT OF CENTERLINE. +5 FT ROAD 180-200 FT FM RY END; +20 FT LGTD POLE 157 FT FM RY END 230 FT R.
TO INCREASE INTST AND ACTVT REILS RY 10/28 - CTAF. 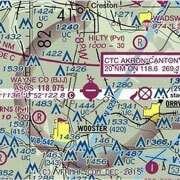 • APCH/DEP SVC PRVDD BY CLEVELAND ARTCC ON FREQS 134.9/317.7 (MANSFIELD RCAG) WHEN AKRON-CANTON APCH CTL CLSD. FAA instrument procedures published for use between 10 December 2015 at 0901Z and 7 January 2016 at 0900Z.